Since we are watching so many owls these days, I thought it might be a good idea to post this link again. Much is known about the dining habits of owls because of certain inefficiencies of their digestive process. More than 300 species of bird in several different orders are known to regurgitate pellets of indigestible material. This figure includes all owl species. Owl pellets are so informative for several reasons. Firstly owls have comparatively weak bills and often prey that isn’t too large is swallowed whole which leaves the skeleton of the prey, including the skull, intact. Unlike most other birds, owls have no crop, and the food passes straight into the foregut (they do not posses a true stomach). The acid in the owl’s gut is rather weak with a pH of 2.2 - 2.5 which is the same as vinegar, this compares to diurnal birds of prey which have a pH of 1.3 - 1.8, which is approaching the pH of concentrated hydrochloric acid. This means that owls can only digest the soft tissues. The bones, fur and feathers remain virtually intact. The opening from the foregut into the rest of the digestive tract is small and prevents any undigested material from passing through. Instead, it remains behind where it is compacted into an oval pellet and is then actively regurgitated back up through the oesophagus. Pellets, therefore, contain bones including intact skulls, fur, feathers, the chitinous exoskeletons of insects and even the chaetae (bristles) from earthworms and so discovering what owls have been eating is quite straightforward. 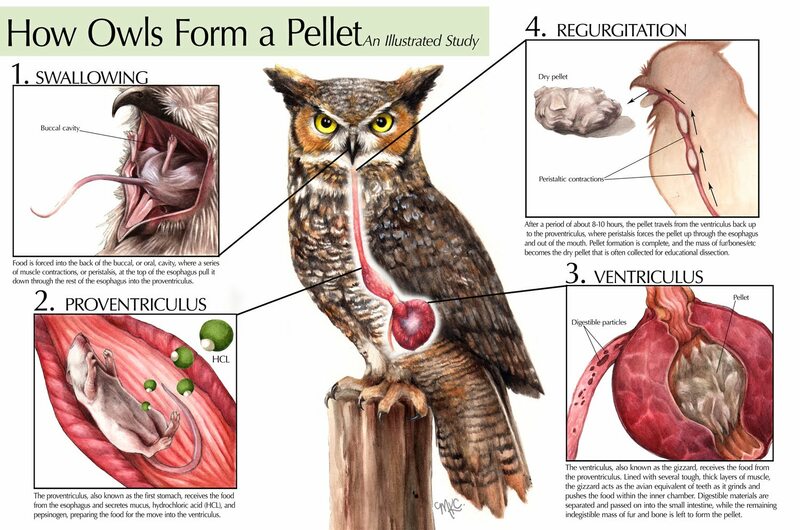 Regurgitating a pellet is a voluntary act on the owl’s part and in the wild most birds will produce one prior to leaving the roost for hunting. Often, another smaller pellet will be produced during the night before the second main period of hunting around dawn. The size, shape and appearance of the pellet is normally characteristic of the owl species, certainly amongst British Owls. One interesting fact relating to owl pellets is that the clothes moth, whose larvae sometimes attack your best woolen suit hanging in the wardrobe, actually evolved from a moth whose larvae feed on the fur and feathers in old owl pellets.